Eek and Ack, the comedic extraterrestrial duo, fly to Earth in their washing machine-shaped ship for the sinister purposing of determining the best way to conquer the third rock from the sun. It just so happens that they land at Lake Lobo, which we already know is home to at least one werewolf. Dressed as a space alien (duh) and a ballerina they head out incognito on … you guessed it … Halloween. The discovery of candy is a nice treat, but the trick is that they also stumble onto a real-life werewolf. Narrowly escaping his cluthes – by the cotton of their space alien Underoos – Eek and Ack do their best to fix the situation. Once back on their home planet, they realize that the monster’s bite is worse than his howl. 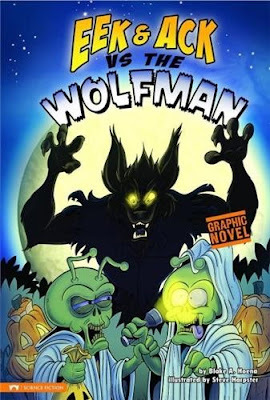 EEK & ACK VS THE WOLFMAN is more comedy than horror with just enough monster goodness to tickle a child’s fancy but not enough to give anyone the slightest nightmare. I laughed throughout the book and constantly thought of the kids at my school and how they would really dig this book. The girls and the boys would laugh at the crazy antics of Eek and Ack. There’s an underpants scene, vomit, a washing machine space ship, and two goofy looking aliens. How could kids not love this book? The pacing is right on with plenty of funny dialogue, great situations, and hysterical action. Of course we have a glossary, pronunciation guide, bios of the creators, discussion questions, writing prompts, further information on werewolves, and even a Fact Hound Internet site. The dark purple page backgrounds and heavy inks on the panel’s frames make for a bit of a creepy crawly tone. The illustration of the characters is a hoot. The two together make for a nice Halloween combination that is just right for little ones. The book provides some interesting discussion questions and writing prompts that kids would Think-Pair-Share about. It might be interesting to have the students create their own comic about two aliens invading Earth. What would happen? Could students make text-to-world connections in the writing to make it funny and appealing? Sounds like that might be asking them to consider their audience, too, which we know is a national standard for this age group.